This incredibly chic Harris Tweed designer dog collar in Silver Grey has been handmade using original Harris Tweed handwoven wool. Each collar is not only extremely robust and durable, but also luxuriously stylish, to compliment your lifestyle and taste. Choose from Small, Medium or Large collars (measurements can be found below in the Details section). The ideal gift for devoted dog owners! These dog collars are handcrafted using original Harris Tweed wool that has been hand woven by the islanders of Lewis, Harris, Uist and Barra in their homes dyed and spun in the Outer Hebrides. They carry the Harris Tweed certification mark on the inside of each collar. This mark certifies that the product complies with the Harris Tweed Act of 1993 and is genuine Harris Tweed, the world’s only commercially produced hand-woven tweed. 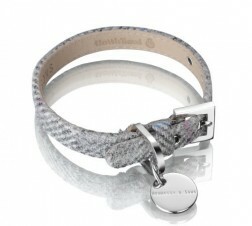 The Harris Tweed dog collar collection uses water resistant, anti-allergenic French alsavel lining. All metal components are in high quality 316L stainless steel for unsurpassed durability and beauty and are 100% anti-allergenic and nickel free. All collars are handmade in Switzerland. Hennessy & Sons donates 2% of its profits to International Animal Rescue as part of the company’s continuing commitment to animal welfare. Every single H&S designer dog collar is carefully packed in a 100% recyclable cotton bag and elegant paper gift box with transparent window.